There is nothing quite like knitting baby garments. I was in a huge knitting slump after my beloved cat Coco passed away and tried to ease back into knitting by making a facecloth. It was something I needed, and knit it hoping to get out of my slump, but it didn’t work. After the dishcloth was knit, the knitting needles went back into the cabinet. While sorting through my old hand knitting magazines, I came across a vintage baby kimono pattern. Babies = rebirth = happiness = inspired to knit again. 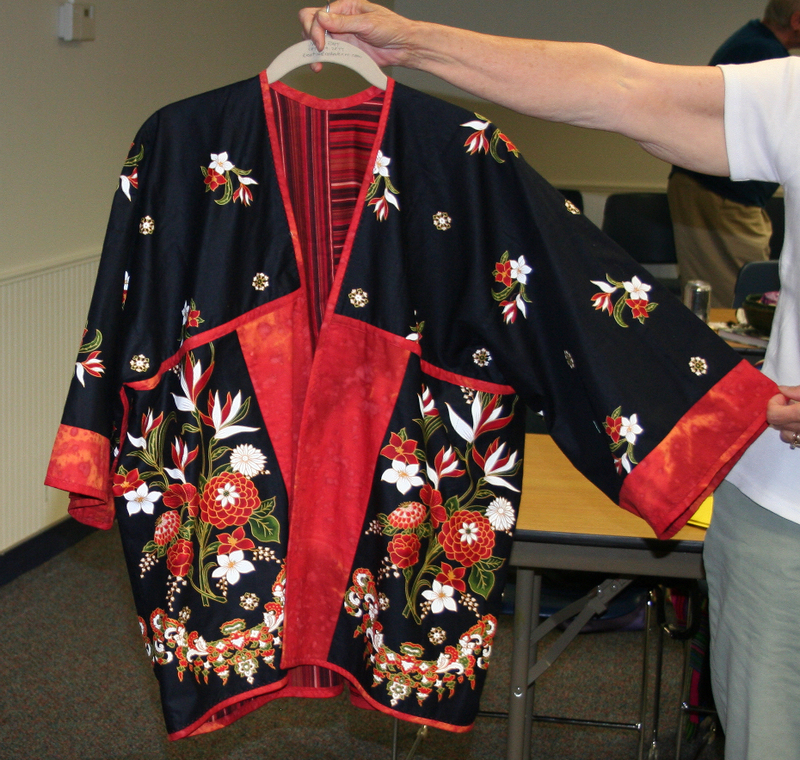 Is that not the most adorable baby kimono? The sleeves look like wings and I can just picture an angelic baby girl in this sweater. The wired bow is on there just for the picture. I will be sewing a very soft elastic around the neckline to keep the sweater in place. A silk ribbon bow will be sewn to a removable snap. This way it can be removed when the sweater needs to be washed, and the baby will be in no danger from a dangling ribbon. It can be put in place for photos only. 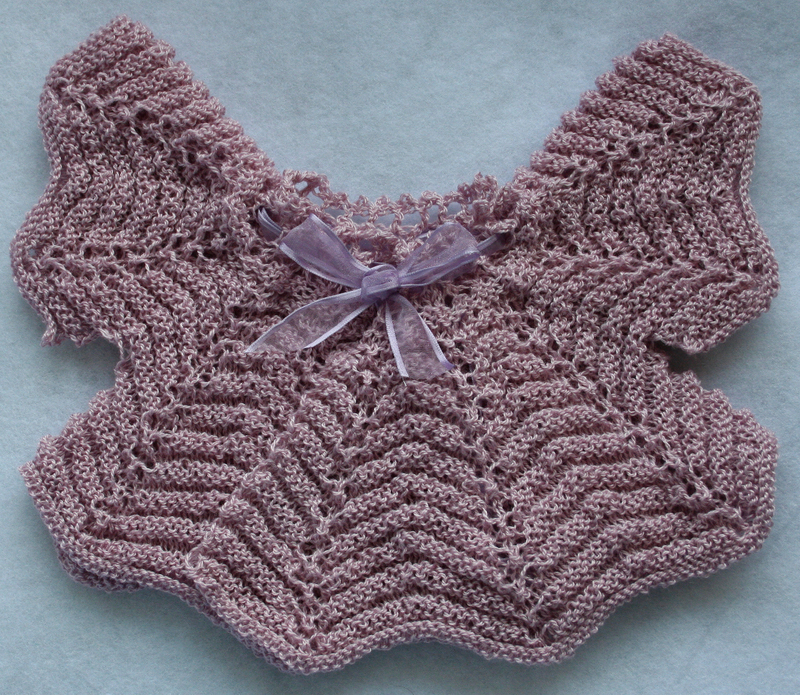 This was knit with one strand of Soft Lilac Moonbeam yarn and took only 1 ounce. 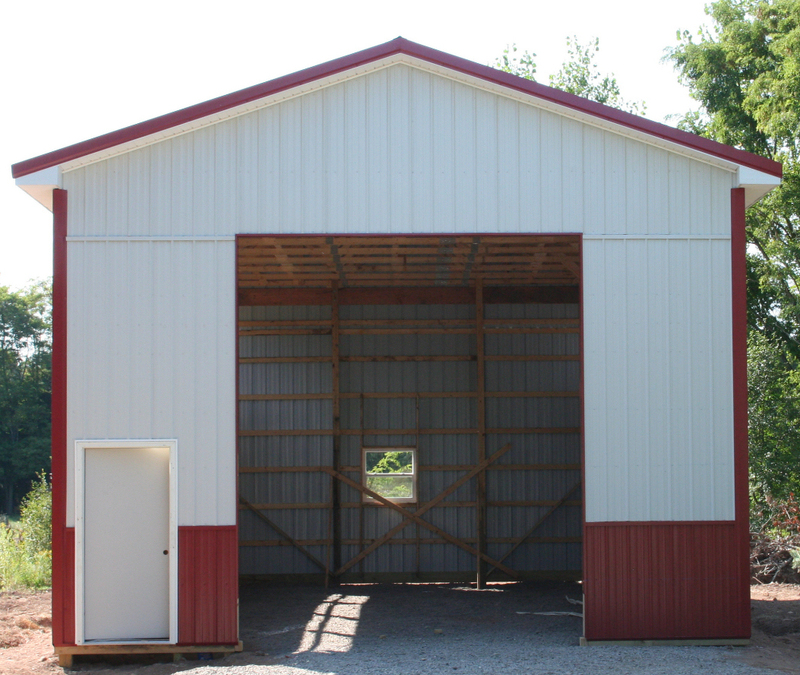 A pole barn update – it is totally finished. I haven’t gotten out there to take a photo yet as I sprained my ankle 2 weeks ago Friday, felt better, reinjured it, felt better, went to strength training Tuesday, and reinjured it again. Now I’m staying put. Hopefully, it’ll start feeling better soon, because this is the same leg that is undergoing vascular laser surgery next week. 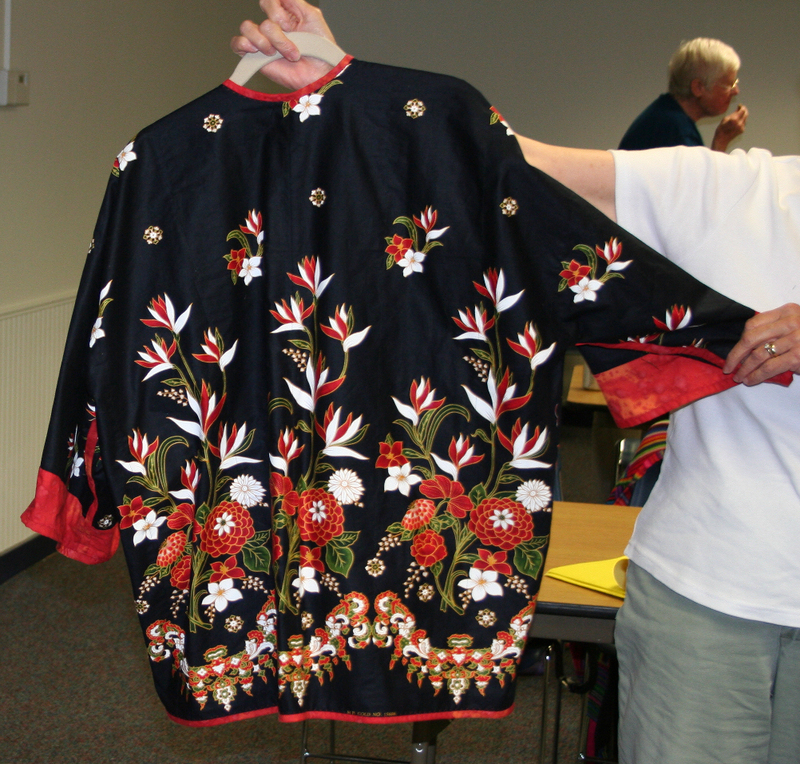 It is a combination of sewing machine embroidery and hand embroidery. The center butterfly was from A Stitch and a Half. The dragonflies were from Criswell. My daughter purchased some embroidery designs for me as a birthday present last year and the dragon fly design was in one of the packages. 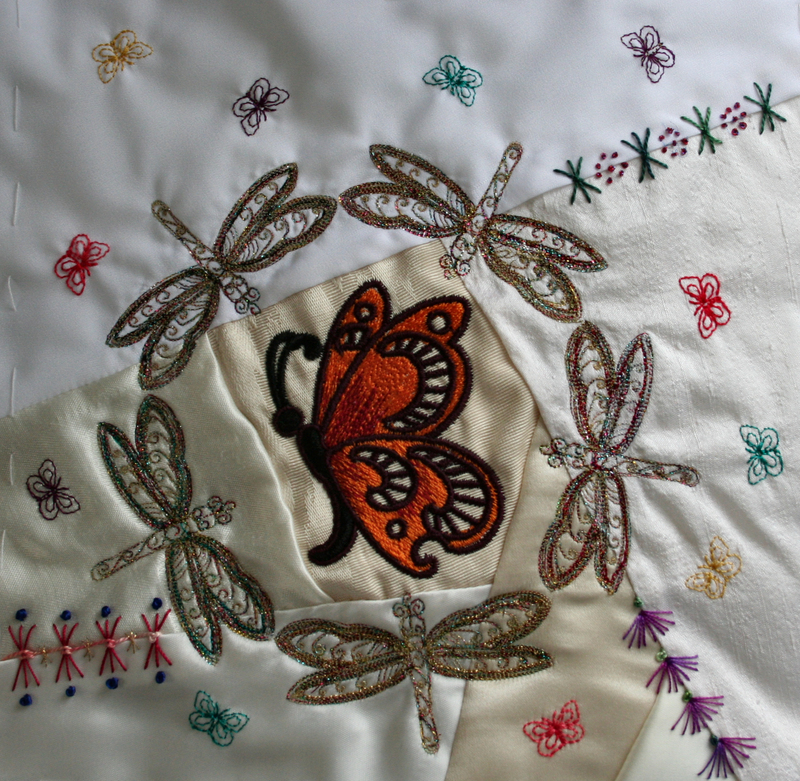 The center butterfly is all rayon threads – mostly from Madeira. Each dragonfly had a different colored thread for the wing outline, then Sulky Sliver was used to embroider the rest of it. I broke 5, yes 5 needles, sewing out those dragonflies. It was worth every one of them. That thread made the dragonflies come to life. Before you all think this was a quick project, after spending an afternoon sewing the crazy quilt block, one evening was spent going through designs on the computer, the next evening I spent arranging the designs on my sewing machine screen, then test sewing them. The forth day I sewed them all out on my pieced crazy quilt block hoping and praying I had everything arranged so that butterfly would be where I wanted it – smack dab in the center patch of my pieced block. 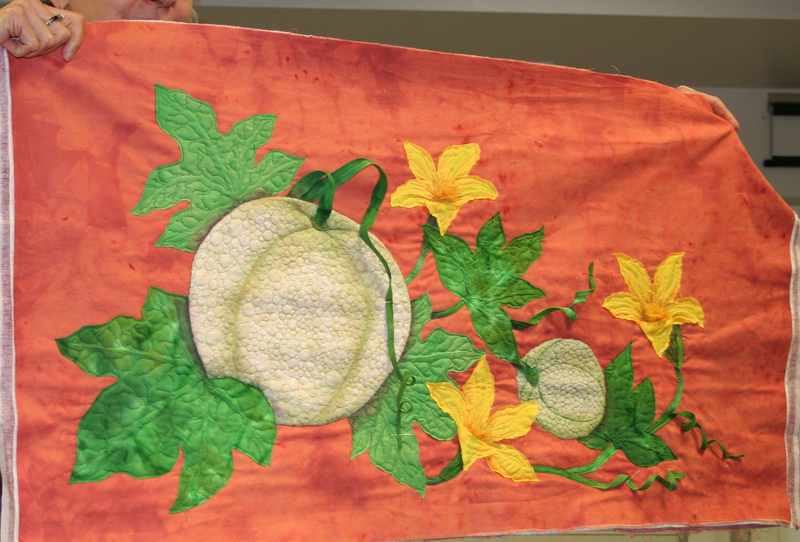 Then I added the hand embroidery – the seam treatments. 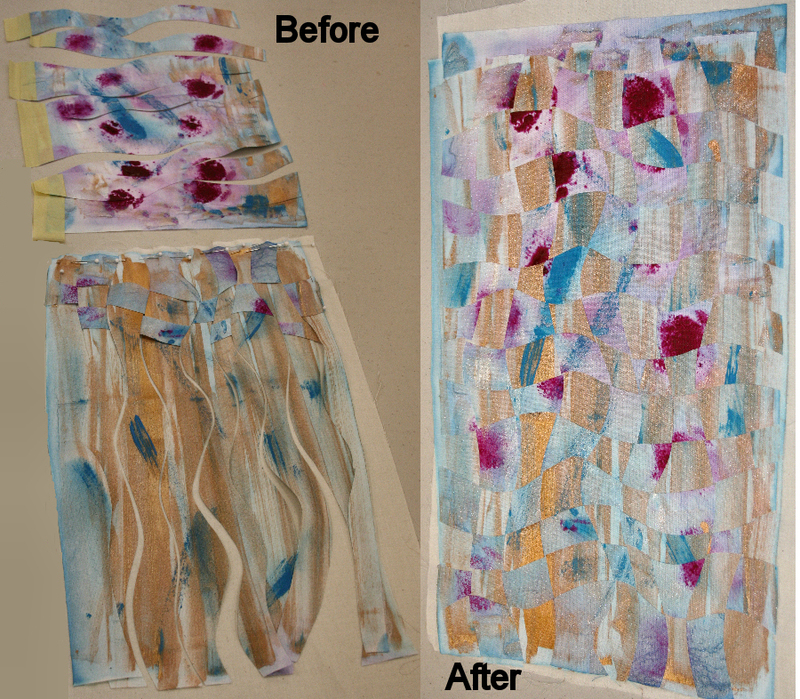 They were a lot of fun and I enjoyed selecting threads and colors for them. Threads used were KNK silk buttonhole twist, DMC rayon, DMC cotton floss, Oliver Twist variegated, Krenik metallic, DMC metallic, and some of my hand dyed 12 wt cotton. That took 2 days. What takes me so long is deciding what stitches to use and what thread combination look good with each other. 2 seams were totally redone and I enjoyed every single minute of that process. Last but not least are the tiny butterflies scattered about the block. We couldn’t use beads on this block and I had the perfect little butterfly buttons and beads that yearned to be on that block. Putting them firmly out of mind, I went back to my sewing machine and found a 9mm butterfly design. Perfect!!! Out came the threads again. This time I used 30wt variegated and solid Madeira cotton threads and some Madeira rayons. I hope it arrives safe and sound to our esteemed project co-ordinator. She’s a saint for putting all these blocks together into a quilt. A big round of applause to Debbie!!! Thursday was the Ogden Art Group meeting and Pat taught a partly curving weaving technique that she learned from Anna Faustino’s book Simply Stunning Woven Quilts. Pat did a terrific job and everybody did their own thing. 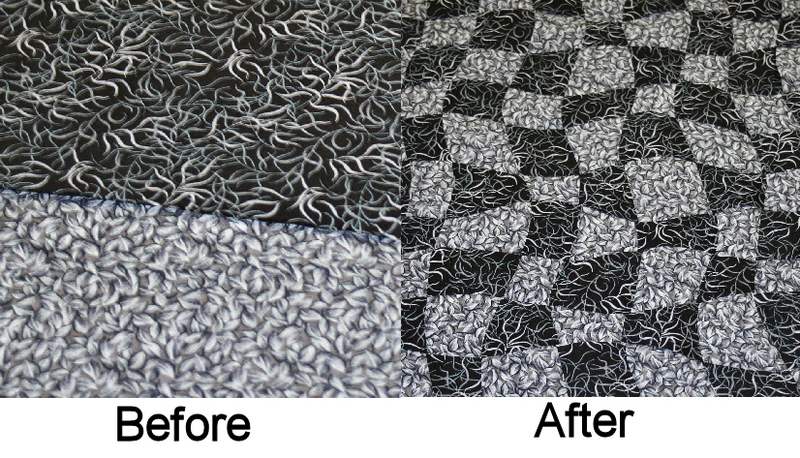 Lucy used classic grey and black fabric. It’s an elegant combination, don’t you think? Maggie and I didn’t start a piece. She’s packing and getting ready to head off on vacation, and I had just finished a piece using the woven technique for the Blank Fabric Challenge, so didn’t want to make another one. 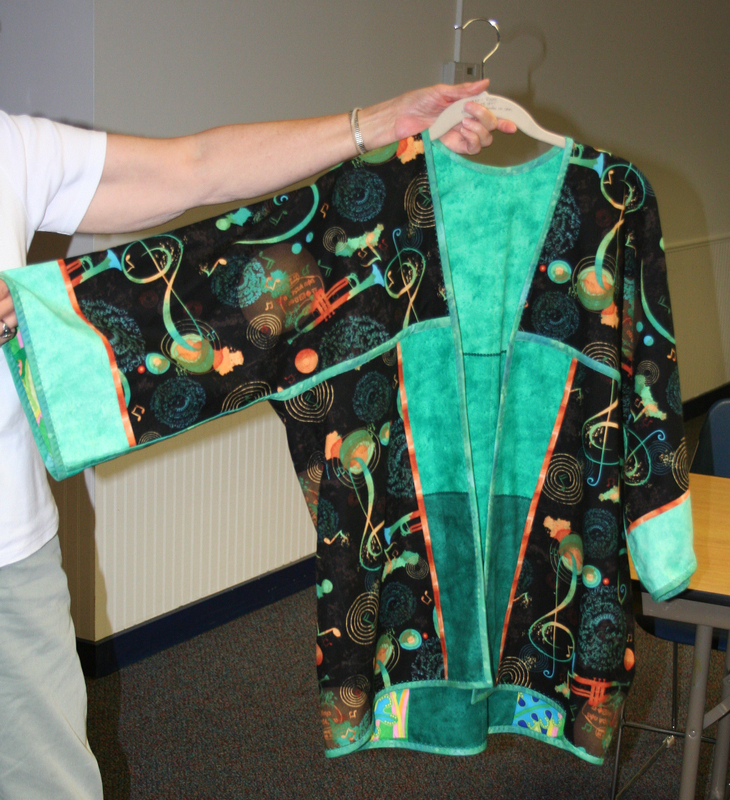 Instead, I happily took pictures, got some magazines out from the library, and knit away on the kimono baby jacket. 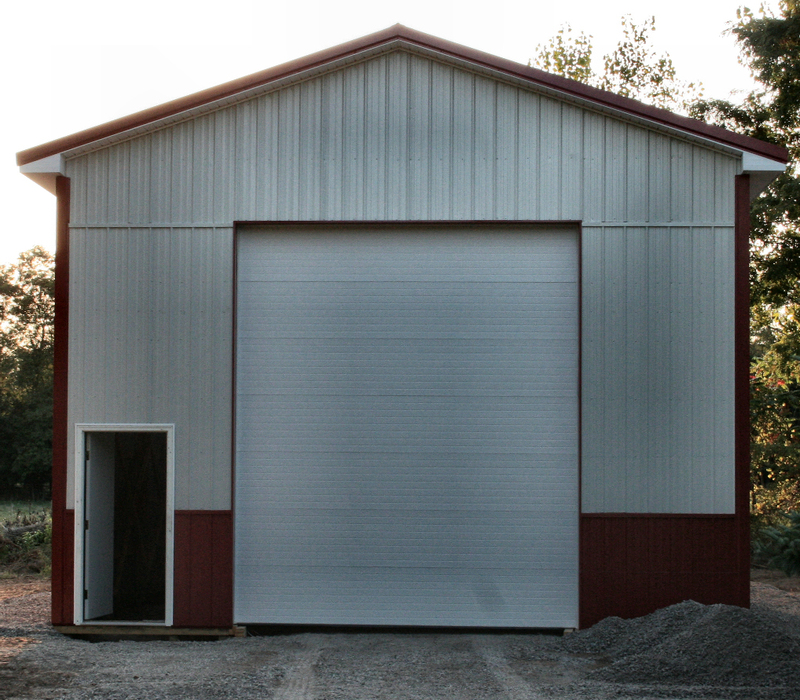 And last but not least, the pole barn now has the overhead door attached. All that’s left is for the rest of the gravel to be graded around the barn and the doorknob and dead bolt to be installed on the human size door. It still needs some translucent panels on the south wall, the big garage door, and more gravel for the floor. Hopefully, it will be finished by the end of the week. There are 3 ways you can wear this purse. 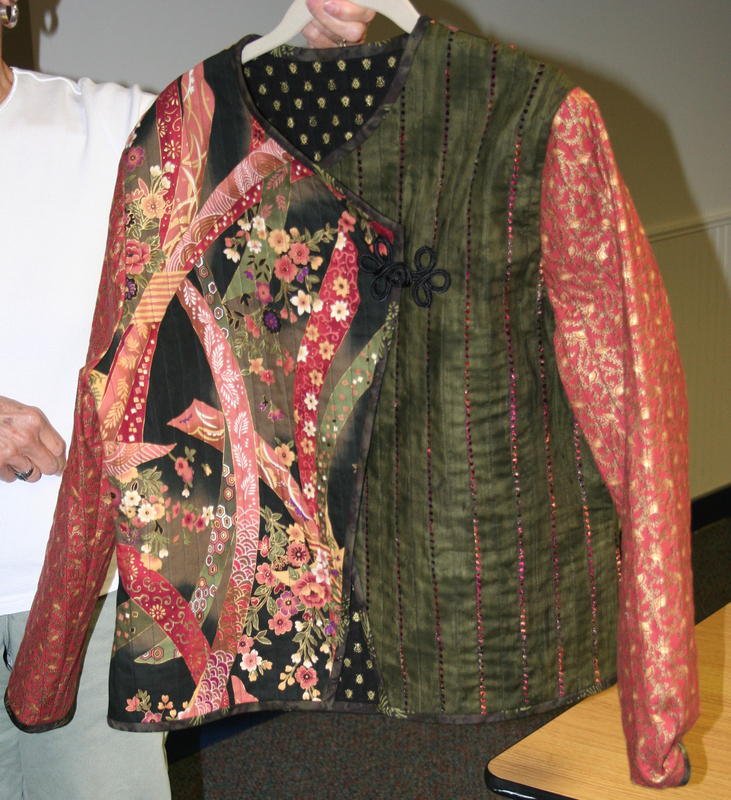 #1 – Slip your arm through the holes and it drapes down the side of your body. This will work well in the summer, but no way is that opening big enough for an arm wearing a bulky winter coat. I live in Upstate New York, so the purse won’t be worn that way this winter. #2 – See the little gold D-rings on the side? 2 G-ring clamps with a strap can be attached to those rings, but my local JoAnns was out of them, so the strap has not been added yet. Instructions for making a tassel and fringe are included in the pattern and that would hang along one edge. It looks really nice on the pattern picture. I’ll add that when the G-ring clamps arrive. 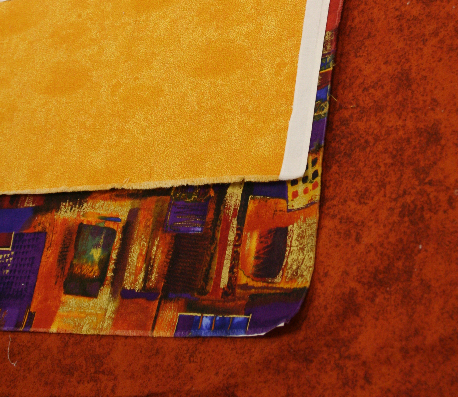 #3 – It can be folded in half and used as a clutch. This purse was a prototype. I didn’t bother decorating it as I was testing it for size. It’s way too small for me. I know, I know, you all think it’s plenty big as it is. Well, I like BIG purses. This one measures 12″ wide by 20″ long, but you can only put things in half that length. 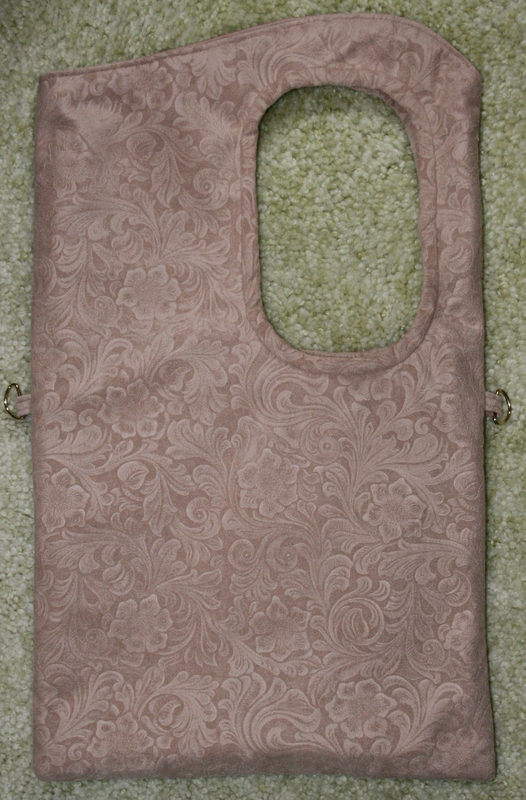 It has 2 pockets inside, but the opening is so small at the top, it’s hard to get your hand inside the purse, let alone your hand with anything in it. My plan is to make it 18″ wide and also flare the top more. This might get accomplished, it might not. I’m not sure I want to bother making it again. Putting that bias binding around the inside armhole was an ordeal. The curves are sharp at the bottom and top edges, so that needs to be reconfigured also. I’m glad I made it, but I’m not too sure I’ll ever use it, or make a larger, reconfigured version better fitting for my lifestyle or not. 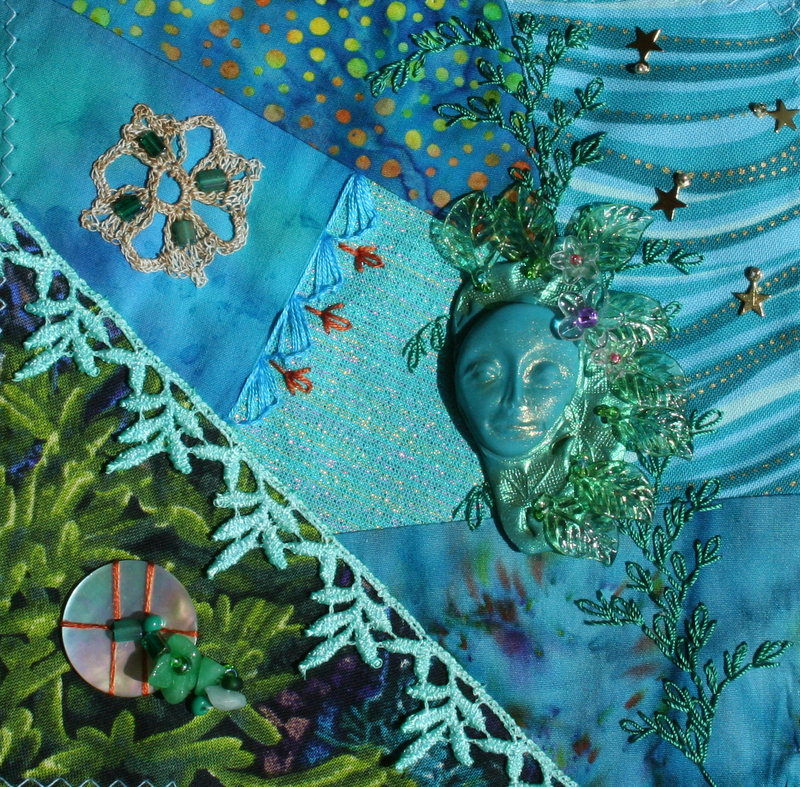 At first, it looked like a face that belonged in the sky, and the wavy fabric on the upper right corner seemed like starlight, then I looked closer at the face and it seemed like there were flowers along the right edge, so my goddess in the sky, morphed into a leaf goddess. I happily sewed the head in place with lots of leaf beads and flower beads with colored centers, then I realized it would look really nice with a tree branch behind her head. Off with her head, and on with the branch, thanks to Jo’s seam book. It was a motif taken straight from her book and it’s the part I liked making the best. There is nothing like sewing with KNK silk buttonhole thread, and that entire branch was stitched with it. Back went the head, a few stars in the upper corner, and then I spent an evening selecting threads for some elaborate seam treatments. When I woke up the next morning I thought, no, the seam treatements I had selected didn’t relate to the foliage theme. Off I went to my lace collection. I found some that fit with the leaf motif, but it was stark white. No problem. 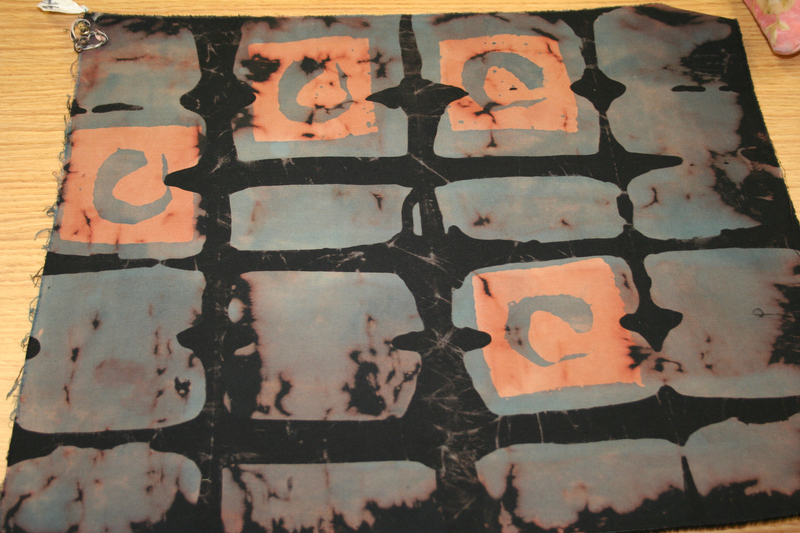 Off to the dye room. I had the perfect dye powders and thought, do I really want to mix up a bunch of dye concentrates? That would be a lot of standing around, a lot of mixing and measuring, and I’m not supposed to be on my feet for long periods of time. Out came the paints. A base of tourquoise followed with some watered down chartreuse worked well. It always look nicer to me when more than one paint color is used on a piece of lace. The undertones do wonders for creating complex shades instead of in your face blue, or in your face green. Next the shell bead was attached. 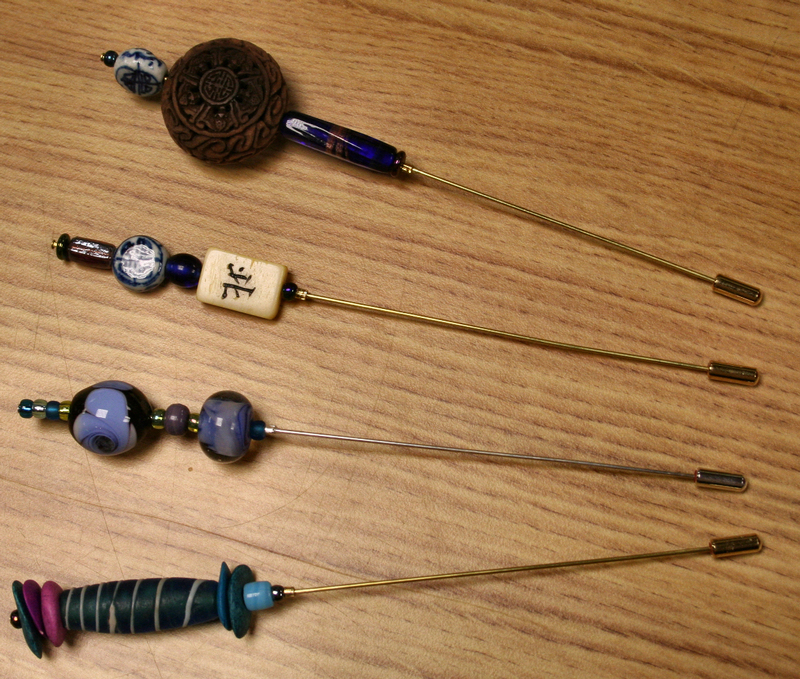 First with squiggly, curvy beads – the same ones used for the flower centers. They looked like worms. Off they came. Then I added a bunch of different color, shapes and types of beads. I’d have liked to make it a much longer bead trail, but was concerned with how heavy the piece had become. One of the ladies in the group lives in Canada, and it would be nice to keep the shipping costs reasonable. I was trying to take with a monochromatic color scheme for the block, but by this point, it was getting a bit too monochromatic for my taste. Back to the thread choices I made for the seam treatments. A nice rusty orange would look great against the green, so I did a bit of stitching to couch the shell button in place. The crochet motif I made out of sewing thread was added next with some beads. 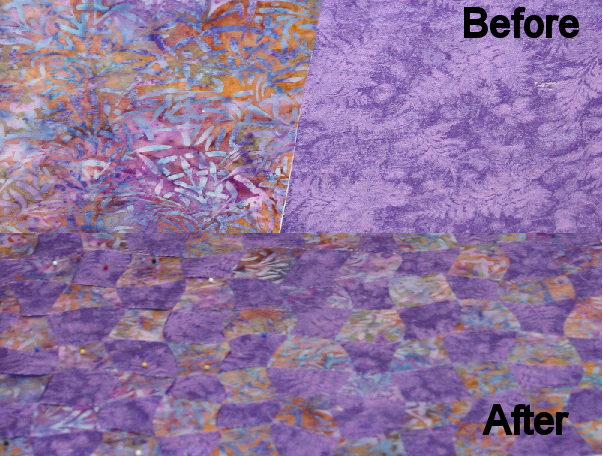 Then the small seam treatment was added. It needs some more to it, but time was running short and I was already 3 days behind with getting this mailed. If I added any more to that seam, I would have missed the mailperson and I did not want to wait till this week to mail the package. So there you have it. My first contribution to the Faces DYB. I hope that Nicki will be happy with this block and would you believe, Leslie’s blocks arrived Saturday. This time I’m starting on the block this week. I WILL NOT BE LATE mailing this one. Late but not forgotten – pictures from RAFA’s last Thursday’s group meeting, lots and lots of them. These meetings are always inspirational, and while show and tell was small this month, there were lots of beautiful works shown. She will be adding some foil and who knows what else to that piece of cloth, but this one really captured my interest. 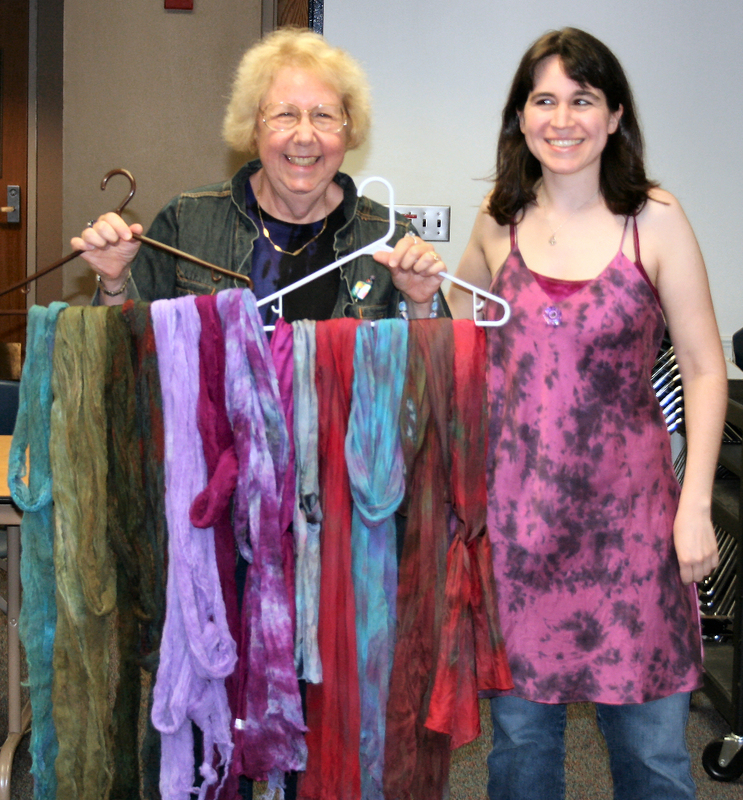 She also hand dyed a bunch of bras – which you can barely see in the photo, but it’s being worn under the dress. And I almost forgot here hand dyed socks. You can’t see them, but Donna – the lady on the left, was wearing them. The glorious color and the beautiful crochet work was inspiring. It gave us all pause to think about the aging process and how a person can stay vital and create beauty all through their lives. There is now a nice gravel base leading from the driveway to the interior of the pole barn. Eventually, it will have a cement floor, but we’ll let the gravel settle for a year before that is added. And do you see that big lift on the left? 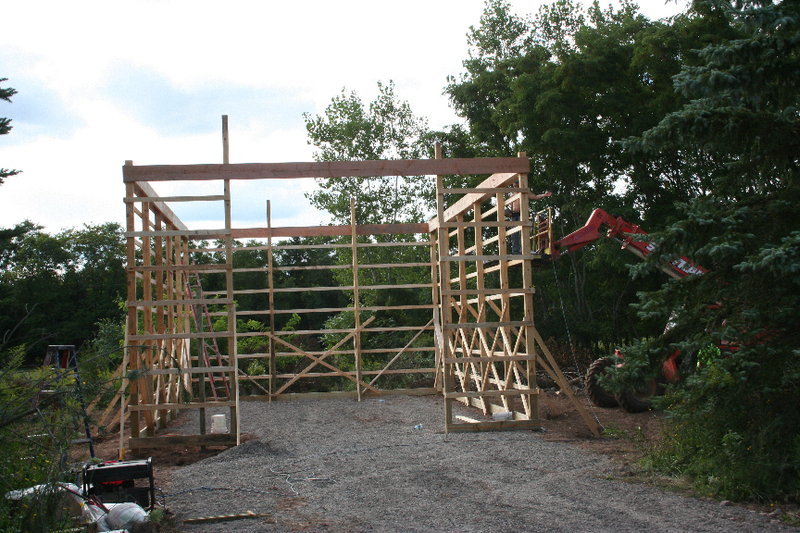 The top wall beams are being added. 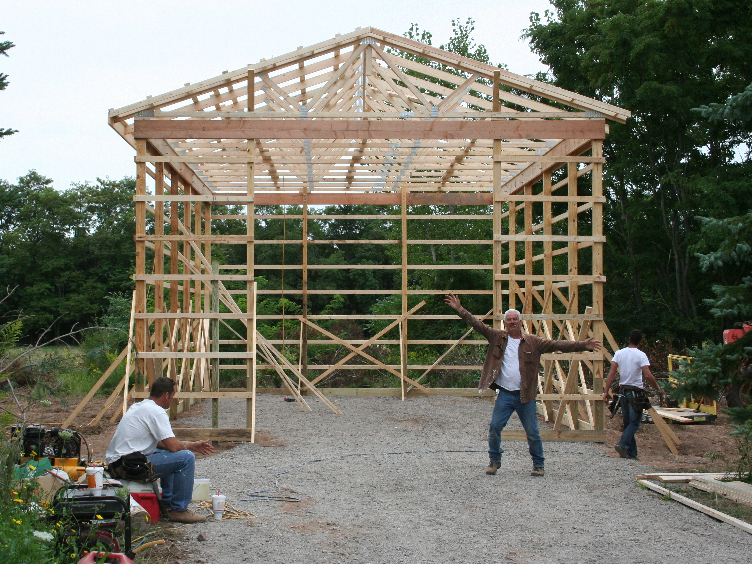 The man with the big smile and outstretched arms is our contractor. He’s an A1 contractor in my book. It’s amazing how fast the shell is going up. 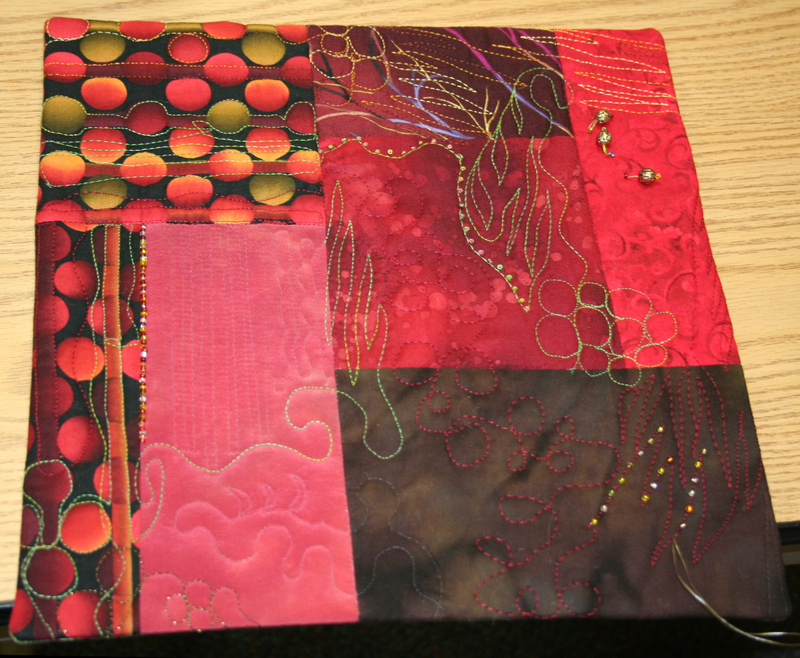 On the textile front, ‘work is progressing on a crazy quilt block – Nikki’s Face DYB block – and it will be mailed this week. 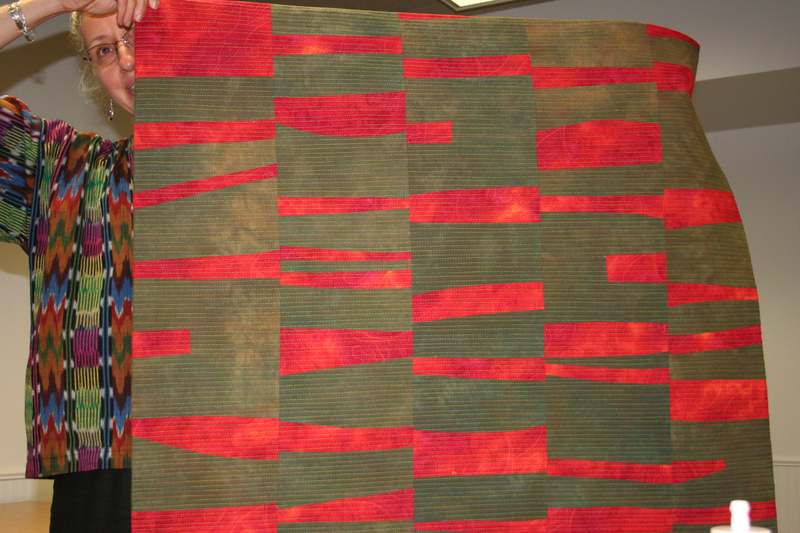 I want to take it the RAFA meeting on Thursday to see if I can get some people interested in crazy quilts. Physical therapy has been completed for my knee injury, the surgical boot is off my foot from the foot surgery, and I see the vascular surgeon this afternoon to hopefully get some help with the circulation in my left leg. I should be good to go after that and am really looking forward to not seeing anymore doctors for a loooooong time. The upside of the knee injury though was going for physical therapy. Everyone there is so nice and did such a good job getting me up and moving again. Now I signed up for their strength training and look forward to every exercise session. That is something I never, ever thought I’d say. It’s all Mark and Arthur and Amy’s fault – the wonderfully kind, helpful, knowledgable physical therapists at Churchville Physical Therapy. They make you feel like family, and so do the two receptionists. I’m having a senior moment and forgot their names, but trust me, they are also wonderful people.